I have a confession to make. Since the opening of the Plein Air art exhibit, I have had a recurring cold. I’ve spent the days during the week before my adventures in southern Idaho, and the days after my return from it before my poetry reading dealing with the return of a virus that doesn’t want to leave. And after my reading, it came back yet again. Nothing too horrible, just a stuffy nose, a funny feeling in my head and gut, a few sneezes, and a foggy idea about whether I’m actually hot or cold. So this past weekend I regretfully skipped Poetry Night and have cleared the decks to rest up and stay out of large groups of people trading papers until this bug is gone for good. Fingers crossed. When I need the vegan equivalent of chicken soup, lentils are my go-to food. They are easy, relatively inexpensive and they cook up quickly. 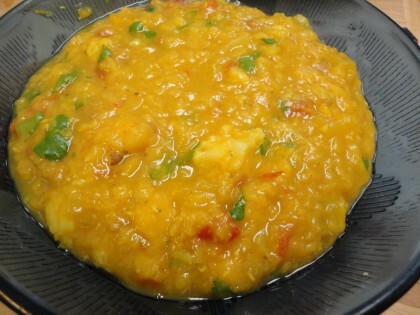 And red lentils cook up quickest of all. They are little powerhouses of nutrition and anti-oxidants. And the Palouse, where I live, is one of the biggest lentil growing regions in the world. So I can eat local too. I have a lot of pictures of this dish because I’ve been making it for several weeks off and on, hoping to get a chance to blog about it. And because it really does help me feel better when I am under the weather. When I first started making this as a soup, I used yellow summer squash, which thickened the soup slightly and gave it a mild sweet flavor. But now that the summer squash are all gone and winter squash are abundant, I gave it a new treatment by adding a delicata squash from my garden. The cubes of delicata give it a buttery flavor and an even more stew-like consistency. 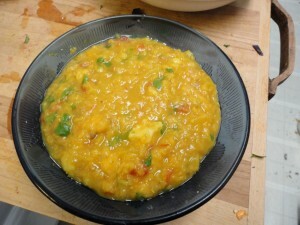 The basic recipe is inspired by the Esselstyn’s Marakesh Express Red Lentil Soup in Prevent and Reverse Heart Disease. I kept their lineup of spices, adding celery seed and fennel, but changed up and added vegetables for different flavors and used less broth for a thicker texture, topping it all off with my “slow miracle” cooking technique. I like my results even better than the original. 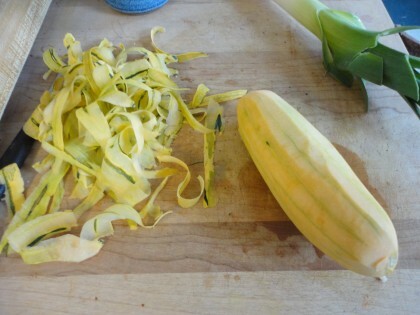 Delicata squash is very easy to peel. The skin is so thin you can use a carrot peeler. That’s what I did. The peelings I put in the freezer along with the leek ends and other goodies I use to make my Everything But the Kitchen Sink Broth. 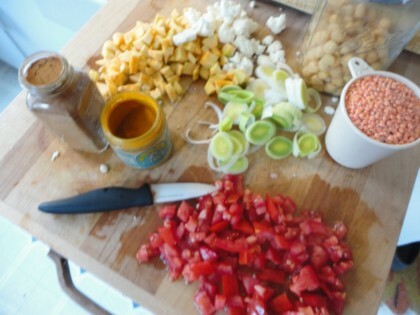 And here’s the line-up of ingredients all set to go into the stew–except for the grated ginger. I never remember it until the last minute. It wasn’t the last minute when I took the photo, so I hadn’t remembered it yet. Saute the leek in a few tablespoons of water or broth until tender and falling apart. Add the veggies and the spices with a little more broth and combine to coat everything with the spices, especially the tumeric and cinnamon. Add lentils, chickpeas and the five cups of broth. (For my broth, I like to use a combination of cooking water from the chickpeas and my Everything But the Kitchen Sink Broth. In a pinch I use steam water leftover from steaming veggies.) Stir and bring to the boil. 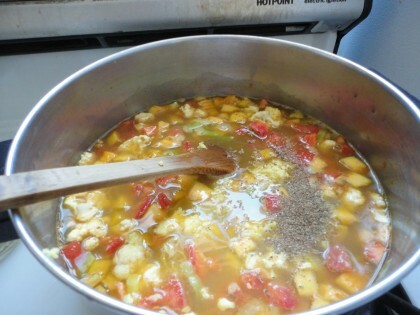 Turn down to simmer, cover and let cook until everything is tender, about 35-40 minutes, stirring occasionally. 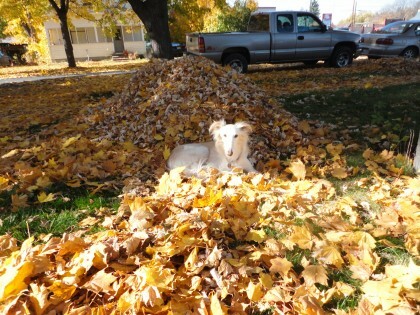 Romeo guarding our pile of leaves while I checked on the stew. Sounds great. I have been wanting to use up my delicata squash and this is the ticket. I do not have califlower but I might sub in carrots instead. Also I might use my slow cooker since I will not have the ability to make it during the lunch hour. Hi Rochelle, and welcome! I think this would go great in the slow cooker, and carrots would be a nice sub. Hope you enjoy it! Yum! Sounds wonderful, I LOVE red lentils. Didn’t know the Palouse was a lentil powerplace! interesting. Thanks for the well wishes, Veronica! I am trying to be patient and making some good progress. Glad you liked the photo of Romeo–he defintely feels possessive of that leaf pile! It’s very cute. The stew looks delicious, but I absolutely LOVE that photo of Romeo! Plus, I envy your fall color. Our leaves are starting to turn, but in this part of the world, most stay green, so there’s not a lot of change. I could use a little more gold. Thanks Susan! Doesn’t he look adorable? And the fall color is gorgeous right now. Wish I could pack you some up. I am feeling a lot better–fingers crossed it holds!! Would butternut squash work? I have no idea what a delicata tastes like, so I don’t know if butternut would work in this dish. Welcome, kathy C, and thanks for your question. Yes, butternut squash would be a good sub for the delicata. They are similar thinned skin, easy to peel and work with. I love all your recipes! But I have no access to Delicata Squash. I was wondering if there might be a good substitute for it? I would love to try this soup! Thanks for sharing your wonderful recipes with us! im going too make this tonight,cant wait. 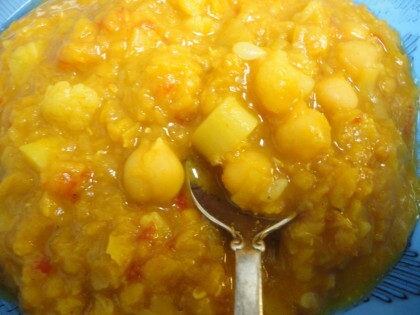 Thanks for posting such a delicious-looking recipe; hope you’re feeling better soon! I too am a big fan of lentil soups – it’s comfort food and so good when you are not feeling up to par. I have to admit that I have never had that type of squash but I do have butternut squash on my kitchen counter that would work for this. Beautiful photos of both Romeo and your colorful leaves. This time of year offers us a glorious color bath when we step outside. Thanks Tami, glad to hear lentils are a comfort food for you too. The butternut will work nicely. So glad you liked the photo of Romeo and the leaves. It definitely is a glorious time of year to step outside. No need to peel the squash, though. It’s really soft like the inside when it’s cooked, and isn’t the skin where all the nutrients are anyways? The name seems apropriate, it’s a small miracle. Loved the idea of making something else while doing it! Wow… made this today (with a few tweaks). .. was a huge hit with the hubs & son! Great recipe and smells soooo great while cooking! Thanks for such a great recipe! Welcome, Joanna! Thanks for your comment–so happy to hear this was a hit with your family!! Wow! This looks so hearty, yummy and comforting! . I am going to make it this weekend! I don’t have any squash but have lots of pumpkin so will probably sub the pumpkin! Can’t wait to make this! Thanks, Ceara, and welcome! I think pumpkin would be good in this too–hope you enjoy it! what can i substitute powdered fennel for and can i use celery instead of the seeds? Hi Sherri–you can try substituting ground cumin for the fennel, and yes, of course you can use celery instead of the seeds. Have fun experimenting!